If you are involved in tobacco control, this conference is for you! The theme for the conference this year is Lifting Our Game. Those of us working in Tobacco Control, need to get better at what we are doing and do things differently if we want to reduce smoking prevelance in Aotearoa. The Smokefree Aotearoa 2025 goal is ambitious but is achievable. The WhyKwit study aimed to investigate what motivates Māori, Pacific Island and low socio-economic smokers to quit. Thirty-five structured focus groups (total N=211) were conducted (Sept 2009-Feb 2010) with Māori, Pacific Island, and lower SES mixed ethnicity groups of smokers and ex-smokers. Robert West’s P.R.I.M.E. Theory of Addiction and its related 3 T’s (triggers, tensions, treatments) model was combined with Te Whare Tapa Wha, a Māori health model and a Pacific health model: The Fonofale to analyse our data. Sets of opposing motivational forces (tensions) to stop or continue smoking and triggers that prompted quit attempts or relapse were identified. Motivation to stop smoking ebbed and flowed depending on the intensity of the forces smokers were exposed to in various contexts in their lives, and how these interacted with their circumstances at any given moment. The analogy of the game of Snakes and Ladders is used to convey the findings. The Snakes & Ladders analogy is a useful vehicle to transfer knowledge about motivation to lay audiences. The Health Research Council and Ministry of Health have formed a new partnership calling for research applications to help reduce tobacco-related harm. The broad objective of the initiative is to generate a targeted programme of research that will provide the evidence base required to reduce smoking prevalence 50% by 2020. The Request for Proposal documents are to be released in June 2010. More information is available on the HRC webpage. Mangere MP Su’a William Sio launched the Teachers’ Say About Smokefree research report, by Dr Marewa Glover of Auckland University, on the influence of teachers in the school smokefree environment. Launching the report in Mangere on Friday 7th May, Su’a William Sio said: “As someone with a personal commitment to being smoke-free, I fully support the research by the School of Population Health which shows the powerful influence of teachers on our kids and how their behaviour is a model that children do take note of. “What also made this launch very important for me is that I spoke to the school-children at Kedgley Intermediate, so that I can influence them not to take up smoking as a habit because I don’t want to hear of anyone suffering or dying as a result of smoking-related illnesses. “They represent our next generation of leaders and, in my mind, we need to protect our young so they live lives that enable them to live long enough to grow, serve and contribute to improving this planet,” Su’a William Sio said. “So I shared with the schoolchildren the events last week in Parliament when 118 MPs overwhelmingly supported a bill into law that raised the price of tobacco in New Zealand. “As I explained to the students, the majority of MPs supported the Bill because deaths resulting from tobacco are preventable and the statistics show more than 5000 people die each year from smoking-related deaths. And among this number, Maori and Pacific deaths are significant,” Su’a William Sio said. “People in our community are now talking about banning smoking in their cars to help bring those terrible statistics down. “There is talk about removing tobacco products from our shores. That will be a challenge for the next generation of leaders represented by the schoolchildren I spoke to today at Kedgley,” Su’a William Sio said. “I hope they take it up because it will take a generation to see a sea change in views about whether it is ever acceptable to sell a product that ultimately ends in death or life-long chronic illness. DURHAM, NC — A novel technology for delivering nicotine to the lungs may soon give smokers a new way to kick the habit. When compared to the nicotine vapor delivery system used in the Nicotrol/Nicorette inhaler, the new technology proved more effective at delivering nicotine to the blood stream. As a result, it provides immediate relief of withdrawal symptoms, according to Duke University Medical Center researchers. Users also reported the new nicotine delivery method was more tolerable than the current inhaler because it caused less throat irritation. Can voice changes after quitting help researchers validate smoking status? A study by the Clinical Trials Research Unit, University of Auckland, concludes: not yet. Natalie Walker of the Clinical Trials Research Unit, University of Auckland, presented the results of the RASP study at the Society for Research on Nicotine & Tobacco Conference in Baltimore, USA this week. The study aimed to assess if there is a change in voice quality up to six-months after quitting, and whether it is possible to validate self-reported smoking abstinence using smokers’ voices recorded over a landline telephone. A simple, non-invasive, inexpensive, method for validating smoking status that is able to be used across a widely-dispersed population without requiring face-to-face contact could revolutionize the way smoking cessation studies are evaluated and population smoking trends monitored. No difference was found between continuing smokers and participants who had quit, but several technical difficulties could have undermined detection of a difference. The researchers conclude that further technical development and research, specifically focussing on improved methods of reducing within-individual variability and cleaner voice recordings is worth pursuing. Voice recognition technology could also be explored to ensure that the same participant is reached for follow-up, they said. Future studies would also need to explore ways to counter the distortions to voice that occur with use of mobile or internet phone use. Nicotine Patch combined with Inhalator most popular choice of cessation product Society for Research on Nicotine & Tobacco Conference in Baltimore, USA told. Dr Natalie Walker of the Clinical Trials Research Unit, University of Auckland, presented the results of the SONIQ (Selection of Nicotine Therapy to Increase Quitting) trial at the SRNT Conference in Baltimore, USA this week. Other New Zealanders presenting include Dr Murray Laugesen of End Smoking NZ and Associate Professor Richard Edwards of the University of Otago, and Dr Nick Wilson. The NZ arm of the International Tobacco Control (ITC) Project has found that price is the major reason for smoking roll-your-owns. The results were published in the NZ Medical Journal last week. The research strengthens the case for increasing tax on loose tobacco to remove the price differential between roll-your-own tobacco and factory made cigarettes. Exploring options for addressing the impact of the current tax structure on the use of roll-your-own tobacco is one of the tobacco control research priorities identified in the recently released Tobacco Control Research Strategy 2009-2012. Wilson N, Young D, Weerasekera D, Edwards R, Thomson G, Glover M. The importance of tobacco prices to roll-your-own (RYO) smokers (national survey data): higher tax needed on RYO. N Z Med J 2009;122(1305):1-5. The 2009-2010 Ngā Pae o te Māramatanga Research Funding Round is open now. Closing date is 26th February 2010. The research round is a contestable round primarily for midcareer and senior researchers and is usually $1m in total. Click here for more information. Click here to view the poster (PDF 230Kb) that was presented on the New Zealand Tobacco Control Research Strategy 2009-2012 at the 2009 Oceania Tobacco Control Conference in Darwin, Australia 7-9 October, 2009. Michele Grigg and Professor Tony Blakely (University of Otago, Wellington) discuss the poster at the conference. Check out the September 2009 Sunday Star-Times feature article on the issue of smoking and what needs to be done about it. More information about this conference can be found at www.srnt.org/meeting/2010/index.html. 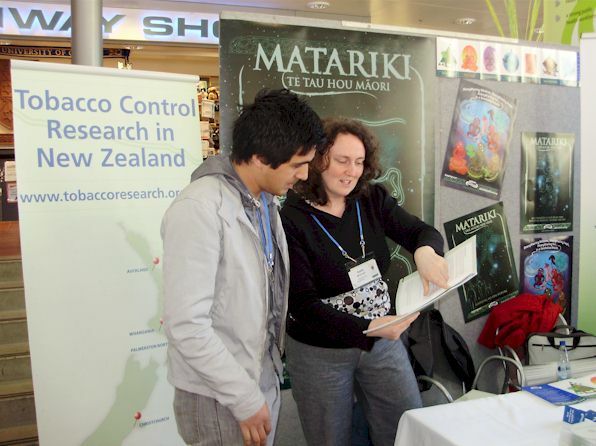 Stella McGough (Researcher from The Quit Group) discussing the 2009 Tobacco Control Research Strategy at the Public Health Conference, Dunedin, 3 September, with George Mita from Public Health South.